There has been a few interesting references made to ePortfolios that have landed in my Reader inbox over the last week or so. E-portfolios have taken up more conference time and wasted effort than almost any other learning technology topic I can recall. What the portfolio provides is something richer than just a number or a grade… It provides a depth of understanding for both the learner and the observer. An interesting and provocative blog post outlining some of the reasons why eportfolios have not had any real impact within education and beyond taken perhaps from a narrow point of view. The ongoing discussion in the comments section is great and adds another valuable dimension for using this post to reflect on and ask questions about your eportfolio use and purpose. Well worth a read. On the flip side this article from the Education Week promotes the use of eportfolios as a method of showcasing student progress. It discusses the authentic nature of eportfolios allowing students to showcase their skills and intelligence, discusses the challenges (time and access) and gives examples of Web 2.o tools being used. Perhaps nothing new here but a good affirmation for those practitioners with similar goals and methods. This resource came through the K12 Eportfolios Google Group, which you may like to consider signing up for. It is a 5 unit Moodle course on creating students eportfolios using Google Sites. Written by Jen Hegna, it is released under a CC Attribution-NonCommercial-ShareAlike 3.0 Unported License. Each unit has a Read, Discuss, Activity, Reflect, Evaluate, Checklist learning design sequence and a wide range of relevant and excellent material is used and referenced throughout. A great resource. 4. Do e-Portfolios make a difference to student outcomes? We are wondering what/if any data schools are using to see if an e-Porftfolio is making a difference to student outcomes. Some our teachers are beginning a Teacher Action Inquiry and need some baseline data so we can see if they have make a difference. Any thoughts? It would be great to see some responses in there to this question. If you are not a member of the Virtual Learning Network (VLN), consider joining and participating in this and other discussion about teaching and learning. Similar in some ways to the 7 reasons why above, this post from The Ed Techie unpacks a number of issues around institutionalised and over complicated eportfolios. A strong case is made for blogs being a better means of achieving eportfolios than specific eportfolio systems. Also, like above, the comments section is hugely valuable where different points of view are offered and counter arguments reinforced. Another worthwhile read. ePortfolio presentation with more emphasis on professional portfolios for teachers for Learning@School 2011 workshop. Towards the end of last year I had a couple of conversations with different people at different ends of the country. Both conversation mentioned three ideas, unrelated at the time; eportfolios, moderation & National Standards. However it got me thinking if there was a relationship between the three and while this post has been sitting on the tip of my fingers for a while,with the recent development of the Moderation Online component in MyPortfolio it is time to get my thoughts down. 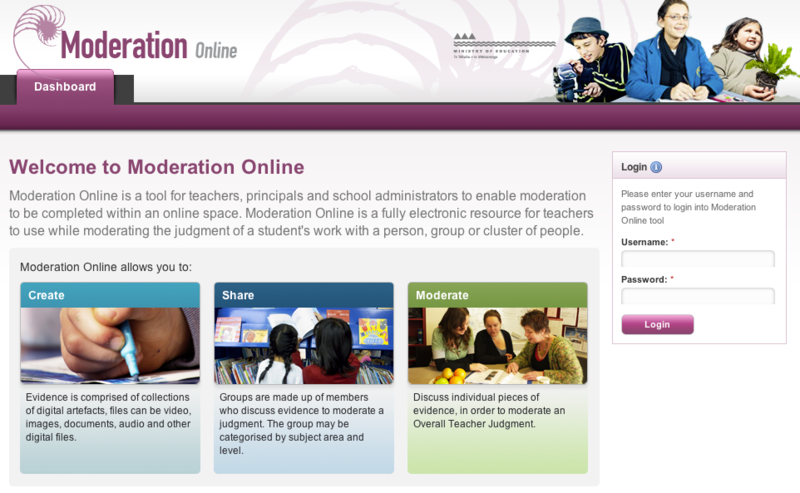 Assessment Online has a great section on moderation, clearly defining moderation, outlining its purpose, and providing resources and suggested processes for implementing it in a school or cluster. 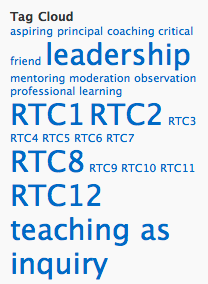 My only issues with this resource is that it does not take into account the possibilities and potential of how technology can connect educators together enabling a national or global network of moderation. Moderation is the process of teachers sharing their expectations and understanding of standards with each other in order to improve the consistency of their decisions about student learning. Assessment Online (2010). So what does this mean when the word online is slotted in at the front of the definition? Does it still make sense? Online moderation is the process of teachers sharing their expectations and understanding of standards with each other in order to improve the consistency of their decisions about student learning. I think so and can see it happening in a couple of ways. In the first scenario shown below the moderation process is brought about from a teacher sharing a sample of student learning and their initial assessment of it in their professional eportfolio. Once posted in the teacher’s eportfolio, the process of moderating the assessment can begin by drawing on the views, expertise and the two way sharing of other learning examples with other educators in the teacher’s PLN. This process is replicated face to face many times throughout NZ each year, both within schools and across clusters. What changes here is that the process has moved to an online space/eportfolio, opening up the depth and breadth of moderation. Elements of this have been online for some time, except that it has been a one way situation where robust dialogue and the sharing of ideas has been absent. The best example of this is how examplars have been posted on TKI/Assessment Online, but embedding this in a collaborative online space will provide a much richer resource professional discourse. More schools and clusters are also beginning to use tools such as voicethread to start moderation conversations of student learning. I can see a lot of potential in this moderation process as part of a teacher’s eportfolio (sure it can happen in other online spaces but when you throw in evidence for the Registered Teacher Criteria, a professional eportfolio is all about working smart). The second situation where standards, eportfolios and moderation could work is shown below. In this instance, it is initially student directed where they are responsible for selecting work to represent achievement of a standard. This is shared with their teacher and in turn with other relevant personnel who are able to share and post other examples of learning as a reference. Once the moderation is complete, the outcome of the moderated assessment is given to the learner and the teacher is more informed about teaching and can plan the appropriate next steps. As with the first example, elements of this are happening in and across school but not necessarily in an online space or as part of an eportfolio process. If I look at the two scenarios above, they both have advantages. The first example can work across any age level from ECE to tertiary and from students with special needs to mainstream and can easily be aligned to the teaching as inquiry framework. The second scenario involves the student as part of the process critically reflecting on their learning, both independently and teacher guided, so the moderation additionally has close ties to assessment for learning practice. Both are about the teacher building their understanding and capability to consistently assess student learning, build self-review skills and put in place improved teaching programmes for improved student outcomes. The scenarios outlined above are the first two examples that came to mind of how the possible relationship between standards, eportfolios and moderation might actually look in practice. What I would love to know is how you may already be doing this, how you are moderating online and how an eportfolio may be part of this process. What I would also like to know is what framework the new Moderation Online space is built around, or whether it is more organic and will develop as users needs are recognised. If you have any answers to these questions I would love to hear from you. I have been doing some reflection recently around eportfolios and the different flavours that are out there to select from. I have categorised each flavour as a ‘dimension’ below. The basis for this discussion is really considering what an eportfolio should be and defining a tool that is as authentic as possible. The problem with most eportfolio systems is that the eportfolio is not the central working (learning) space, it is generally a space where learning is brought to and then shared and reflected upon. There is a lack of authenticity here and often a double handling of learning artefacts. So the question… is there a dimension of eportfolios that removes or minimises this issue? Enter the Google Teacher Dashboard, more on that below. When we consider this difference in a digital frame, what does it look like? Are current methodologies of eportfolio use really authentic? Do they clearly show the learning process? Are they capable of supporting all learning? Are eportfolios a true representation of the learning or just a snapshot? A dedicated eportfolio system such as Mahara. The eportfolio functionality or module built in or attached to a learning management system such as UltraNet, KnowledgeNet, Moodle etc. ePortfolios that are contained within an online tool such as Blogger, WordPress, Wikispaces, Weebly etc. An eportfolio that is not contained in any one place. It draws on the functionality of several online spaces and web technologies, using the best features of those tools to create and share learning. An example could be this netvibes dashboard. ePortfolios that are created using desktop software and are not online. They are typically shared after being saved to a disk. Common software for this includes PowerPoint, Keynote, iWeb etc. ePortfolios that are seamlessly integrated into the way students are learning. It is a direct reference to the work being done by Hapara with their Teacher Dashboard. You may consider the Teacher Dashboard as not being an eportfolio at all, more a customised Google LMS. I too do not see the Dashboard itself as an eportfolio, more a window into a student’s eportfolio. The more I think about it, the more I realises that the Dashboard is integrated into what can be seen as an extremely powerful eportfolio system, one that re conceptualises current frameworks. Current eportfolio systems (i.e. dimensions 1 -5 above) have not really done anything radically different in terms of presenting an eportfolio. I know that fans of Mahara and its views would probably disagree with that, but current eportfolios are still spaces where the learning is (generally) taken to, rather than produced and there is so much learning that is ‘missing’. The Dashboard is built on students working in the cloud, learning with tools provided through the might of Google Apps. The Dashboard is the teacher’s window into this cloud, enabling managing and tracking these spaces with ease but more importantly seeing every step of the process, identifying progress and enabling more personalised and just-in-time feedback. Student control and sharing is not lost with the functionality of sharing docs, sites or your blog retained, both within and out of the domain as per a normal Apps or Blogger account. The Dashboard and the behind the scenes set-up provides a framework for students to work and share in. Schools determine the framework for how the student environment is organised and what is seen in the Dashboard. Additionally, the Dashboard draws in other student data by integrating with your SMS. So as a potential eportfolio system it is different… the key difference for me is that the central working (learning) space is accessible and therefore builds in more capacity for support and learning conversations than conventional eportfolio tools. This is the closest digital version of a book look I have seen. Is the Dashboard the future of eportfolios? Take the time to read the post on the Hapara blog. Consider the potential. Don’t think of it with your current eportfolio hat on, look beyond that and what an eportfolio will look like when students are increasingly working online. What makes the difference between the Dashboard just being a great way of managing and monitoring student activity within Apps and also being a great eportfolio system? Perhaps this hinges on access. If students are learning in a highly digital environment with 1-1 or similar access and in Apps, then it will work like a dream. To be honest even if student access is not that high, I would still grab the opportunity. If you have Google Apps for your school, you are going to want Teacher Dashboard. Whether that fits your eportfolio framework and dimension is over to you but the potential here is huge. Further to a previous post I have added three new discussion questions to use when thinking about some of big underlying themes surrounding eportfolios. I can’t take credit for the thinking behind these questions as they have stemmed from comments left on this blog or through face to face discussions when visiting schools. …what measures is the school going to put in place so that there are consistencies between classroom ePortfolios? Parents will compare and complain if one teacher is not perceived as doing much. I don’t know if my question reflects exactly the point Jamin is making, mine is more related to surface features but will recraft it at some stage. Jamin refers to the content and makes a valid point. Often in schools we ask for consistency and commonalities in ‘school-wide’ approaches to teaching and learning. There are core values and beliefs that guide what we do. At a different level schools may develop guidelines that describe expectations for such areas as planning and assessment. 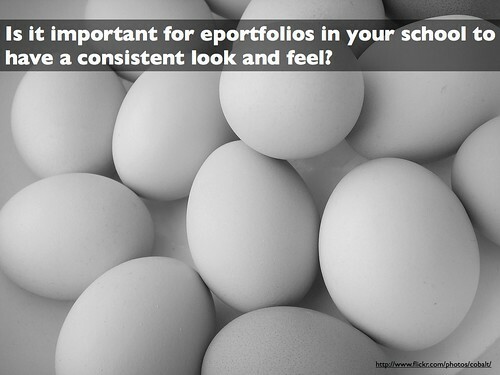 Is it therefore necessary to develop guidelines for eportfolios, what goes in them and how often? Or would this defeat the purpose of a student directed, student owned eportfolio that supports the learner and instead become a prescriptive teacher directed product? A conversation with Deidre Alderson, principal of Willowbank School prompted this question. We were discussing eportfolios and getting parents online and involved in leaving comments and giving feedback to their children in these online spaces. I outlined how in my research parents of year 3 and 4 students showed a much higher involvement than those at year 5 and 6. We discussed a number of reasons why this may be which I also discussed in my research. Deidre had a new perspective on this. She suggests that how students want to get feedback and the form that feedback takes changes over time. For example, a younger student may really respond to and deliberately seek out feedback yet an older student may only want feedback when they specifically ask for it and perhaps not from you as a teacher or parent at all. While the eportfolio is only one of many ways to give feedback to students, is the feedback we are giving online inline with what they want, regardless of whether it is technically correct (purposeful, specific, related to criteria, includes next steps etc). perhaps there could be a question directed at the use and management of eportfolios for staff journeys? 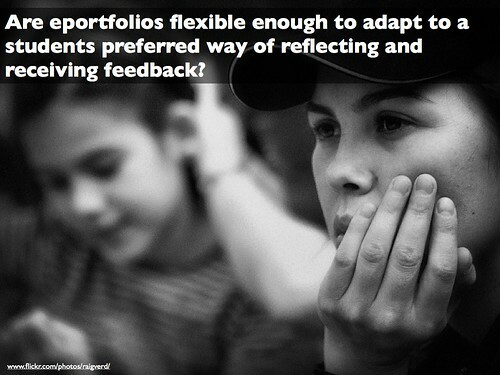 Staff documenting their own learning as an e-portfolio would help build confidence that may not be there at present. I agree. As simple as the saying ‘walk the talk’ is, no more could it be truer here. And what a rich authentic alternative to an appraisal checklist type approach to teaching competency. Not to mention the reflective practice involved in an eportfolio that sits hand in hand with the teaching as inquiry approach to knowledge building. Why wouldn’t you want staff to have their own? So there we go. Three more questions to discuss if you intend heading down the eportfolio route or if you are in the process of review how you are implementing them currently. Once again, would love to hear of any questions or areas that I have not considered! I have got a lot of time for Graham Attwell’s thoughts around eportfolios. I referenced his article e-Portfolios – the DNA of the Personal Learning Environment? in my ePortfolio research. He also contributed to the MOSEP (More Self-Esteem with my ePortfolio) project which is well worth a look. Is an e-Portfolio intended as a space for learners to record all their learning – that which takes place in the home or in the workplace as well as in a course environment or is it a place or responding to prescribed outcomes for a course or learning programme? 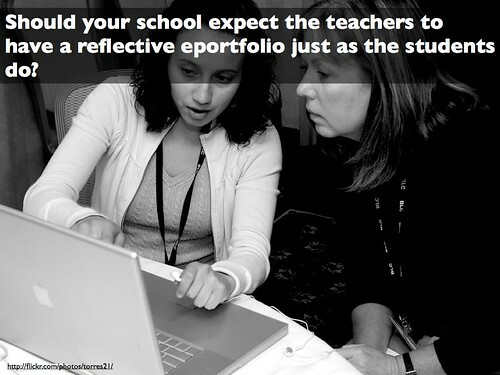 How much should an e-Portfolio be considered a tool for assessment and how much for reflection on learning? Can one environment encompass all of these functions? And such technologies as OSPI, Elgg and Mahara. Further discussion involves Mash Up Personal Learning Environments and research looking at the value of light weight widgets for promoting reflection that can be embedded in existing e-learning programmes. All interesting stuff and worth a couple of minutes of your time. TEDx Talk. Dr. Helen Barrett on Social Networks and Interactive Portfolios: Blurring the Boundaries. Electronic Portfolios have been with us for more almost two decades, used primarily in education to store documents and reflect on learning, provide feedback for improvement, and showcase achievement for accountability or employment. Social networks have emerged over the last five years, used by individuals and groups to store documents and share experiences, showcase accomplishments, communicate and collaborate with friends and family, and, in some cases, facilitate employment searches. The boundaries between these two processes are gradually blurring. As we consider the potential of lifelong e-portfolios, will they resemble the structured accountability systems that are currently being implemented in many higher education institutions? Or are we beginning to see lifelong interactive portfolios emerging as mash-ups in the cloud?